The beginnings of a Philly heat wave? 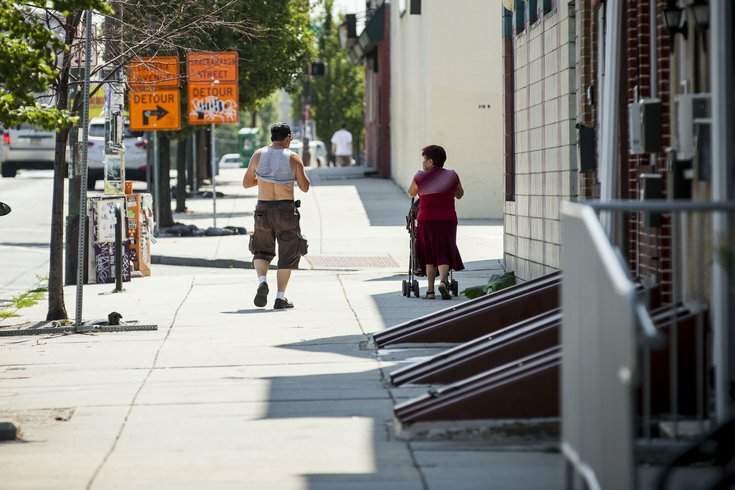 A couple walks on Girard Avenue in hot weather, Monday, July 20, 2015. Despising your overcrowded, delayed commute on SEPTA? Let's add some brutal heat to the mix, shall we? The National Weather Service has issued an excessive heat warning for the Philadelphia region, which is in effect from 11 a.m. Wednesday until 6 p.m. Friday. Temperatures will reach dangerously hot levels. Highs are expected to be in the low to mid-90s for the next few days, but it will feel more like it's around the 100s during the afternoons Thursday and Friday. 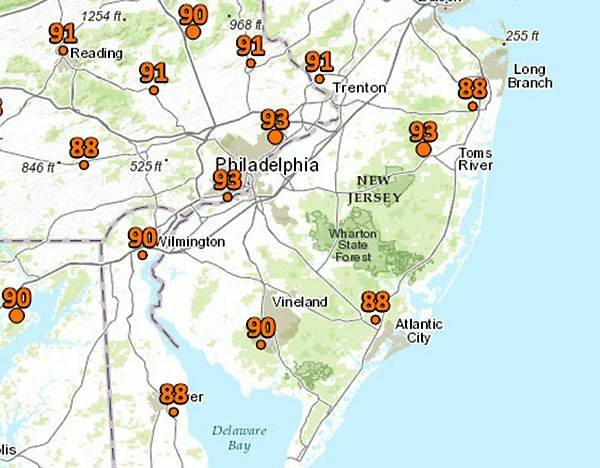 At 4:50 p.m. Wednesday, the temperature at Philadelphia International Airport had reached 93 degrees. The worst of the heat – and humidity – is expected Friday, forecasters said. Lows are expected to be in the 70s on Wednesday and Thursday night. The warning extends into northern Delaware, Camden, Trenton and parts of the Philadelphia suburbs. Montgomery County officials have issued a "Code Red" hot weather warning for Wednesday through Saturday between the hours of noon and 8 p.m. The NWS is warning that hot and humid conditions may lead to heat-related health issues, especially for the elderly and those in poor health. The city of Philadelphia has also issued a heat warning in conjunction with the NWS. The city has recommendations on what to do when there's excessive heat. Guidelines state that you should drink plenty of water (and avoid alcohol and caffeine when possible), take cool showers and baths and wear a hat or use an umbrella for shade. Residents are also encouraged to check on elderly friends, neighbors and relatives. The city's "Headline" will be available from 9 a.m. until midnight on Wednesday, Thursday and Friday. City housing officials will be checking on homeless people,. They'll bring them water, encourage them to find air-conditioned areas, provide transportation and call for medical assistance when needed. For more tips, check out the city's website here and here, and the NWS' warning here. Things are expected to stay hot through the weekend, with chances of scattered showers and thunderstorms on Friday and Saturday. Temperatures are supposed to dip into the high 80s Sunday, Monday and Tuesday. Wednesday: Sunny, with a high near 95. Calm wind becoming west 5 to 8 mph in the afternoon. Wednesday Night: Partly cloudy, with a low around 76. Southwest wind 5 to 9 mph becoming light after midnight. Thursday: A chance of showers and thunderstorms after 2 p.m. Partly sunny, with a high near 96. Heat index values as high as 101. Light west wind becoming southwest 5 to 9 mph in the morning. Chance of precipitation is 40 percent. New rainfall amounts of less than a tenth of an inch, except for higher amounts possible in thunderstorms. Thursday Night: A chance of showers and thunderstorms, mainly before 2 a.m. Mostly cloudy, with a low around 75. West wind 5 to 7 mph becoming calm in the evening. Chance of precipitation is 30 percent. New rainfall amounts of less than a tenth of an inch, except for higher amounts possible in thunderstorms. Friday: A chance of showers and thunderstorms, mainly after 2 p.m. Partly sunny, with a high near 94. Light and variable wind becoming southwest 5 to 7 mph in the afternoon. Chance of precipitation is 40 percent. New rainfall amounts of less than a tenth of an inch, except for higher amounts possible in thunderstorms. Friday Night: A chance of showers and thunderstorms. Mostly cloudy, with a low around 76. Chance of precipitation is 40 percent. New rainfall amounts between a tenth and quarter of an inch, except for higher amounts possible in thunderstorms. Saturday: A chance of showers and thunderstorms after 2 p.m. Partly sunny, with a high near 93. Chance of precipitation is 30 percent. Saturday Night: A chance of showers and thunderstorms before 8 p.m. Partly cloudy, with a low around 71. Chance of precipitation is 30 percent. Tuesday: Mostly sunny, with a high near 89.